War has ensued following an attack on the Mothership, and problems have escalated for the occupation of space elements among several alien races of nearby constellations. You are the leader of one of the six great races fighting for the central sector of the Cosmos. You need to transfer all your interstellar fleet to this disputed area before the rest — but you need to be careful as even a single unsuccessful placement on the subspace can break the entire fragile gravitational balance and lead to a devastating anomaly! The tumbling of ships from subspace happens in a random way, so one must be very dexterous and attentive. 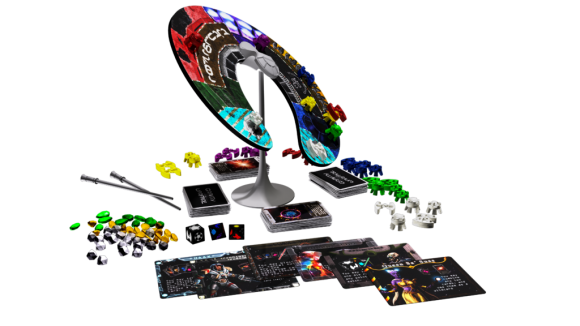 Enemies are also playing a role and are capable of twisting time and space to ruin your plans, strategically placing their interstellar fleet in key locations. 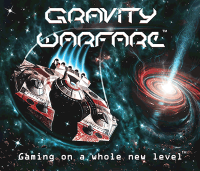 In Gravity Warfare, you play one of six commanders of alien races, each with a special ability, and your goal is to either run out of pieces (troops) to play or make other players lose on their turn. To do this, you must strategically choose your challenge cards and use your ability against other players on their turn, while having the dexterity to make it through yours. At the beginning of the game, each player is dealt one guardian card to protect themselves and seven cards from the deck, of which they must choose five to keep. The cards contain challenges or events such as "Spin it!" or "Stack it!" which you may issue to other players, one per turn. On a turn, the active player rolls the dice to determine which piece of their army to play, and where to place it. Other players now have the opportunity to force that player to play their turn in a certain way by playing their challenge cards. For example, if I have the "Spin it!" challenge, I may use it on your turn if I want you to spin the board and play your turn while the board is moving. Game should be released in 2018 Q4, so watch the news!